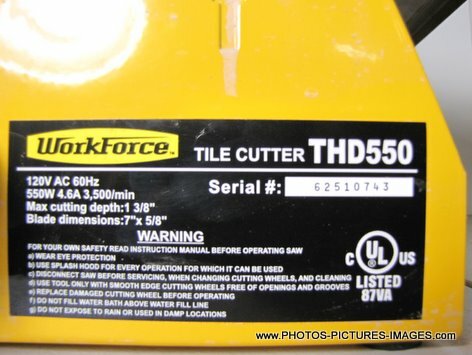 Here is a photo of my Workforce Tile Cutter THD550. I bought this ceramic tile cutter from home depot When I decided to tile my home by myself. I used this ceramic tile cutter for about one week . Once I was done installing ceramic tiles in my bathroom I figured it was easier to hire a professional ceramic tile installer to install tiles in the rest of the house. Make your tile work flow a bit easier with this Workforce tile cutter saw. The cutting table and angle guide are stainless steel. The Workforce Tile Cutter THD550 has the capability it cut any size tile, can also cut 0 - 45 degree miters. Max cutting depth is 1 3/8"
Lightweight (28 Lb.) for easy mobility.